Born in Manchester, NH, a native of North Fort Meyers, FL, and a 2001 graduate of Academy High School, Sergeant Michael Roy, enlisted delayed entry into the Marine Corps and left for boot camp in September 2001. Sgt. Roy, began his career as a rifleman at Camp Lejeune, NC, and was assigned to the Fleet Antiterrorism Security Team (FAST) Company, Yorktown, VA. Sgt. Roy returned to Camp Lejeune where he was assigned to the Antiterrorism Battalion, 2nd Marine Division, and completed Scout Sniper training, to receive a secondary MOS designation in March of 2005. Sgt. Roy joined MARSOC in March of 2008. 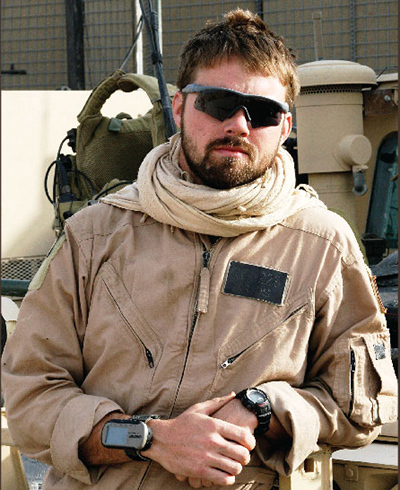 He deployed in support of both Operations Iraqi Freedom and Enduring Freedom. Sgt. Roy is remembered for his steadfast commitment toward life, his family, and the Marine Corps. While on a mounted combat reconnaissance patrol acting as turret gunner in his vehicle in Khash, Nimroz Province, Afghanistan with 3rd MSOB, Sgt. Roy’s convoy came under rocket propelled grenade, PKM and small arms fire from insurgents. Sgt. Roy died as a result of the firefight. Sgt. Roy’s personal decorations include the Navy-Marine Corps Achievement Medal, two Combat Action Ribbon, three Navy Meritorious Unit Commendations, two Good Conduct Medals, the National Defense Service Medal, the Armed Forces Expeditionary Medal, a Humanitarian Service Medal, four Sea Service Deployments Ribbons, a NATO Medal-ISAF Afghanistan, and the Global War on Terrorism Medal. Sgt. Roy was awarded the Purple Heart and a Bronze Star with combat “V” posthumously.